Stevenson & Sons Funeral Homes has been an active part of Southeastern Montana life and culture since 1962. Our community activities range from tours of the funeral home for children, to participating in local, regional and state organizations, to entering parades and car shows. We open our doors to local schools for tours, which include a short film that helps children and teens understand the process of a funeral and burial. Each year we enter our 1920’s hearse in various local car shows. Of course, our Clydesdales are continuously participating in events and parades, as well as weddings and funeral processions, around Montana. We are proud of our community and enjoy each and every opportunity to become a part of, and make a difference in, the lives of southeastern Montanans. The Family Business Program is the only program of its kind in Montana. It provides recognition to pioneering and successful family businesses through the Montana Family Business of the Year Awards Program. 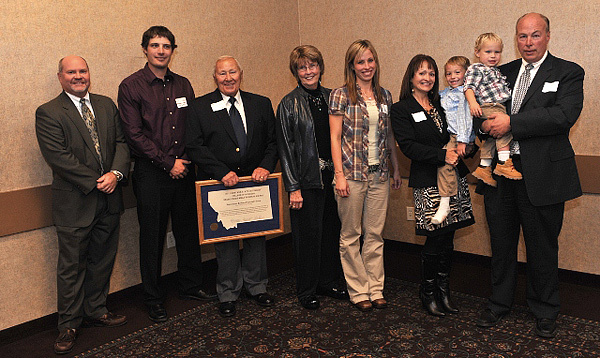 This coveted Montana award was presented to the Stevenson family at the 18th Annual Montana State University College of Business/State Farm Insurance Family Business Day Awards Luncheon on October 7, 2011. Present in the photo above are Stanley Markuson, Ren Gardner, Dale & Marlene Stevenson, Tiffany Stevenson-Gardner, Terri and Todd Stevenson with grandsons, Carson and Cooper.